Hey friends! Its been a while… over a year! Boy has life changed a lot in the last year, which is why I have not posted in so long.First, I got pregnant, was deathly ill and couldn’t even look at food, then had a beautiful baby girl and was too tired to cook. Truth be told, I kind of fell out of love with cooking for a while. I felt uninspired and bored with everything. I guess that happens when you’re nauseous and don’t have an appetite. My husband did a lot of the cooking and some nights we just ate cereal and went to be at 8pm. It has only been recently that I have found my desire to cook again. Much of that is because of my new favorite cookbook by Sarah Waldman called Feeding a Family. I have been cooking my way through her delicious cookbook which has time and family friendly recipes. Everything I have cooked from her book is flavorful yet simple to prepare. This recipe for panzanella salad is a perfect fall dish – tomatoes and peaches are plentiful and the sweet and salty combo is to die for. I hope you enjoy this and many other recipes from Sarah’s book – I will definitely be posting more soon! In a large bowl, toss the bread pieces with 2 tablespoons of the olive oil, then sprinkle with 1/4 teaspoon of salt. Arrange the bread on a rimmed baking sheet in a single layer. Bake for 20 minutes, stirring halfway, or until evenly toasted. In a large bowl, gently toss the tomatoes and peaches with the remaining 1/2 teaspoon of salt. Transfer the tomato-peach mix to a colander set over another large bowl; set it aside to drain while the bread toasts. Lift the colander of peaches and tomatoes out of the bowl and set it aside. Whisk the remaining 6 tablespoons of oil, the vinegar, and black pepper into the tomato-peach juices. Add the toasted bread pieces, toss to coat and let them soak for 10 minute, tossing occasionally. 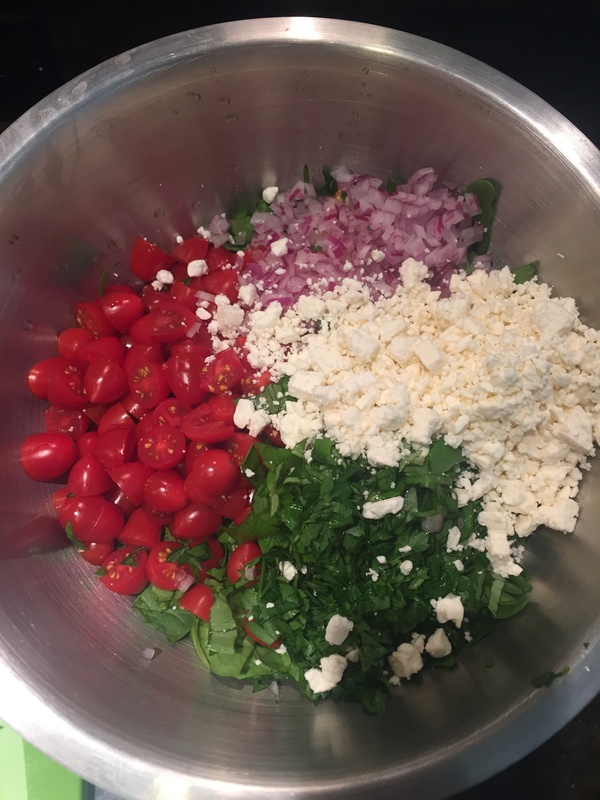 Add the tomatoes and peaches, red onion and basil to the bowl with the bread and toss to combine. Season with salt and pepper to taste and serve immediately. 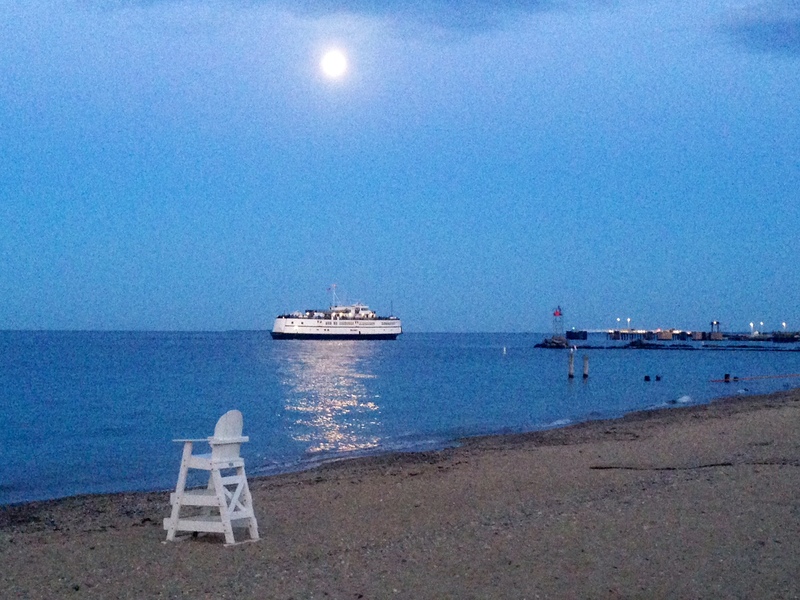 Labor Day… the last hurrah of summer. I love fall so much, with the cool air, changing leaves and football season, but it always makes me sad when Labor Day rolls around because it means summer is really over. 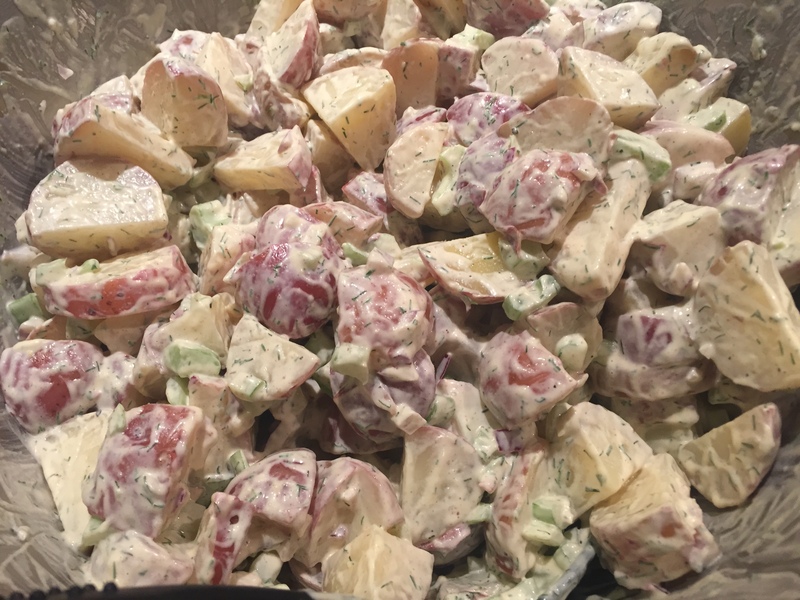 Potato Salad feels like a summer dish, something you make for BBQs and beach picnics, but this recipe calls for lots of fall produce, so why not soak up the last weekend of summer with this creamy dill potato salad. I had seen this recipe a while back in one of my favorite Ina Garten cookbooks and I am glad that I tried it! The comb of dill, buttermilk and crunchy celery make this salad super flavorful. Its really easy to prepare and it makes enough to serve 8-10 people easily, so its great for a crowd. Hope you enjoy the long weekend with family, friends and good food! Cheers. Place the potatoes and 2 tablespoons of salt in a large pot of water. Bring the water to a boil, then lower the heat and simmer for 10 to 15 minutes, until the potatoes are barely tender when pierced with a knife. Drain the potatoes in a colander, and place the potatoes back in the empty pot and cover with a clean, dry kitchen towel. Allow the potatoes to steam for 15 to 20 minutes. When the potatoes are cool enough to handle, cut them in quarters or in half, depending on their size. Place the cut potatoes in a large bowl. While the potatoes are still warm, pour enough dressing over to coat them completely. Add the celery and red onion, 2 teaspoons of salt and 1 teaspoon of pepper. Toss well, cover, and refrigerate for a few hours to allow the flavors to blend. Serve cold or at room temperature. There is nothing more delicious on a hot day than a crisp, fresh salad! 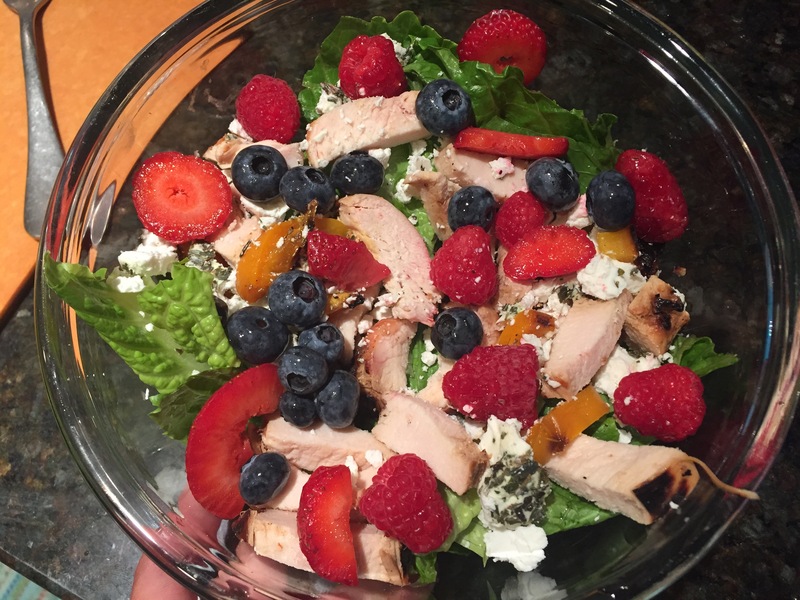 One of my favorite summer salad’s ’round town these days is over at the Boneyard Saloon and Wine Dive, called the Berry Berry Salad. The original version of this dish has a delightful combination of blueberries, cranberries, goat cheese and pumpkin seeds that come together to make your mouth sing! For this remake, I decided to add a couple additional ingredients, plus some juicy grilled chicken for added protein…boy oh boy did it come out delish! Pair this with a nice glass of pinot grigio or frosty brew and you’ve got yourself super fresh dinner or lunch. Enjoy! With the 4th of July this weekend I bet a lot of you are pulling out the grills, dusting off the camping stuff from Memorial Day and getting ready to enjoy a long weekend with family and friends. Here in Park City it has been hotter than the surface of the sun for two weeks straight- a cool 90+ every day! I can’t stand the thought of turning on the stove inside my house so we have been doing a lot of grilling outside. I have a few fans going all the time in the house and I feel like it is doing nothing! If you’re reading this post and you’re near the ocean, please stop what you’re doing and go swimming for me. right. now. thanks. This recipe is great for camping or at home on your grill. Feel free to switch up the hot sauce for your favorite variety. But most of all have a wonderful holiday weekend! Enjoy! 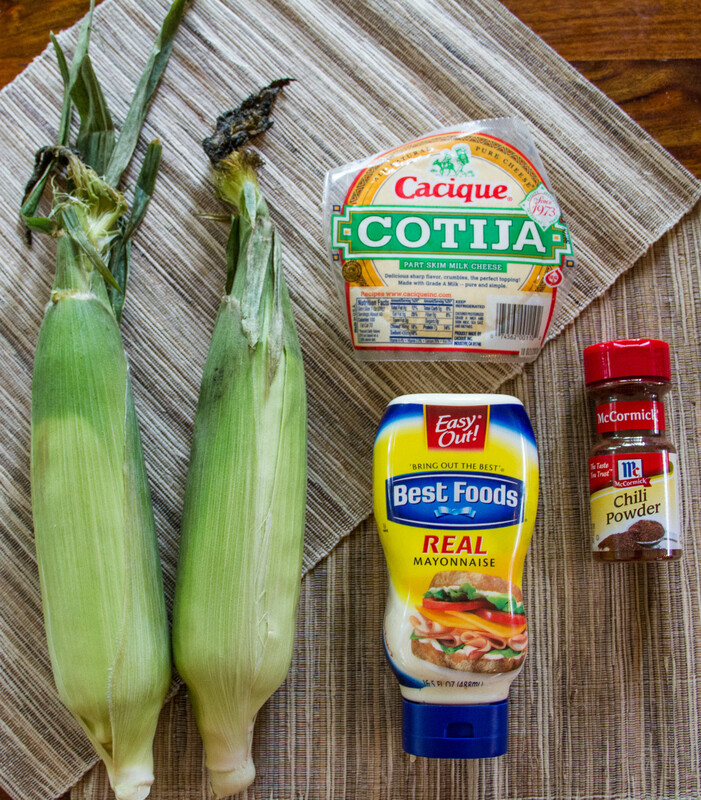 Place two pieces of corn side by side on a piece of tinfoil. 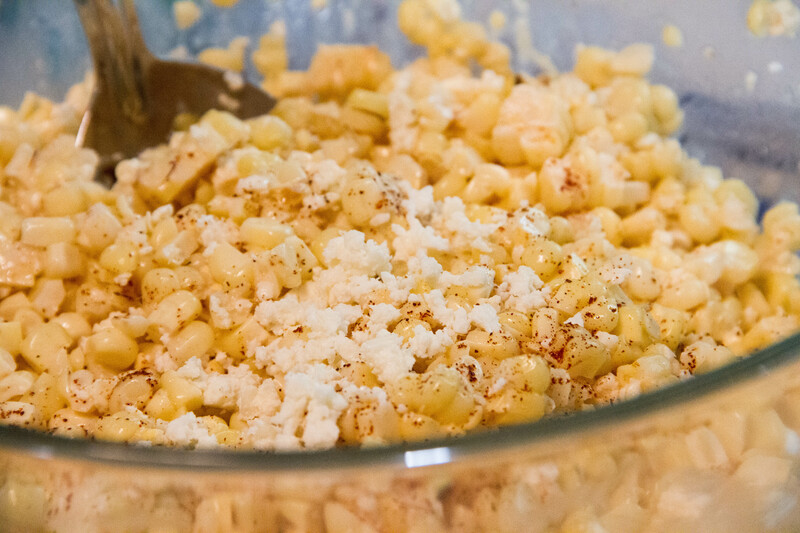 Place 1 Tablespoon of butter evenly across the two pieces of corn. Drizzle 1 tablespoon hot sauce and season with salt and pepper. Repeat with the other two ears of corn. 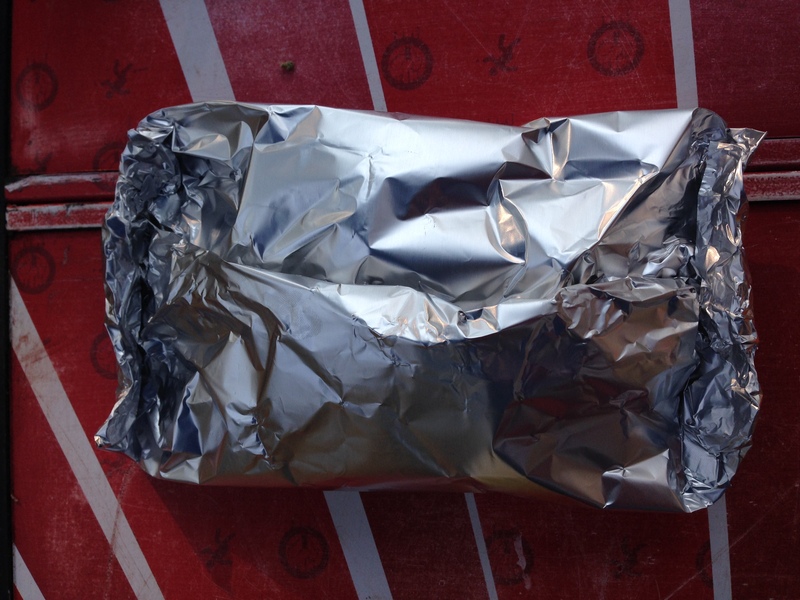 Bring the tinfoil sides together and roll down to make a pocket. Place on the grill or campfire for 7-10 minutes. Flip and cook another 5-7 minutes. Carefully check the pocket to see if corn is tender/golden brown. If you hear the corn starting to pop, flip the packet or turn down the heat. Remove the corn pocket from the heat and allow it to sit closed for 5 minutes. This will allow the corn to steam a little longer and trap in all the flavor. 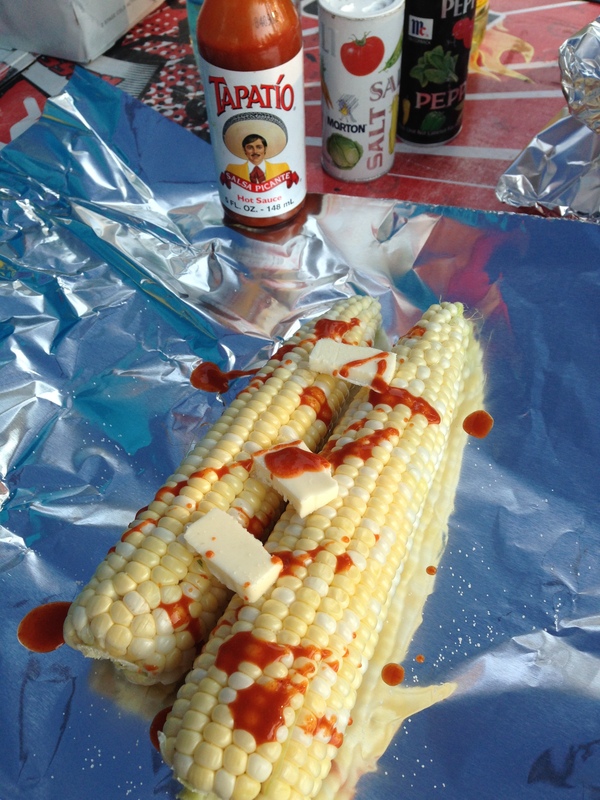 When ready to serve remove the corn from the foil and enjoy! Labor day weekend has crept up on me all to quickly. The last two weeks we have been getting a stead stream of midday/afternoon rain and thunder storms, which were accompanied by a big temperature drop (we even got a little snow on the very top of the high mountains). All those rain clouds do make for beautiful sunsets! I am feeling cheated out of the last few warm weekends of summer and so do the leaves on the trees… they are starting to turn yellow and orange, oh no! I start to feel that end of summer sadness when the air gets crisp at night and the smell of wood burning stove lingers in the air. I hate to see summer go, but fall is one of my favorite times of year! 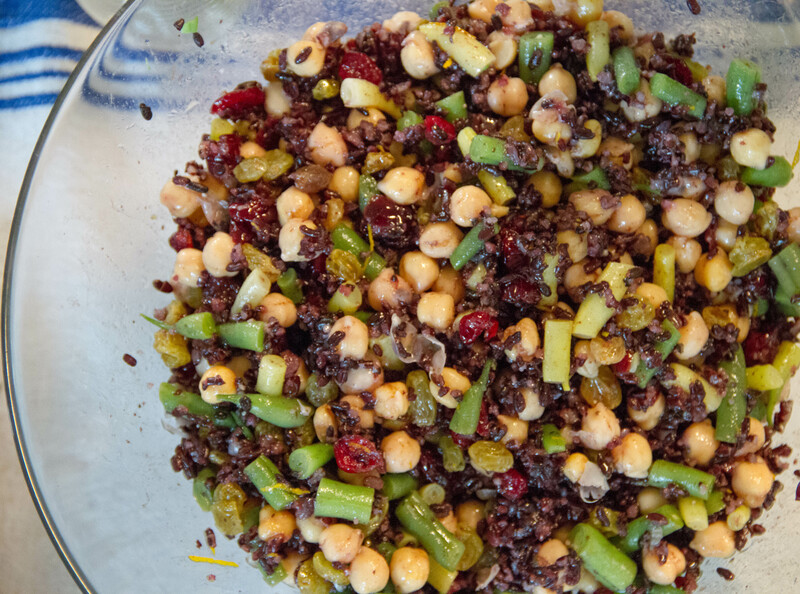 This recipe for forbidden rice salad is wonderful as a summer or fall recipe. It is hearty enough for lunch or dinner as a vegetarian dish, or it’s perfect as a side to steak, burgers or grilled chicken (like in the Blonded by Style and SBITK Mexican Fiesta). I think it’s even better when it sits in the fridge overnight, allowing the juices to meld and marinate. 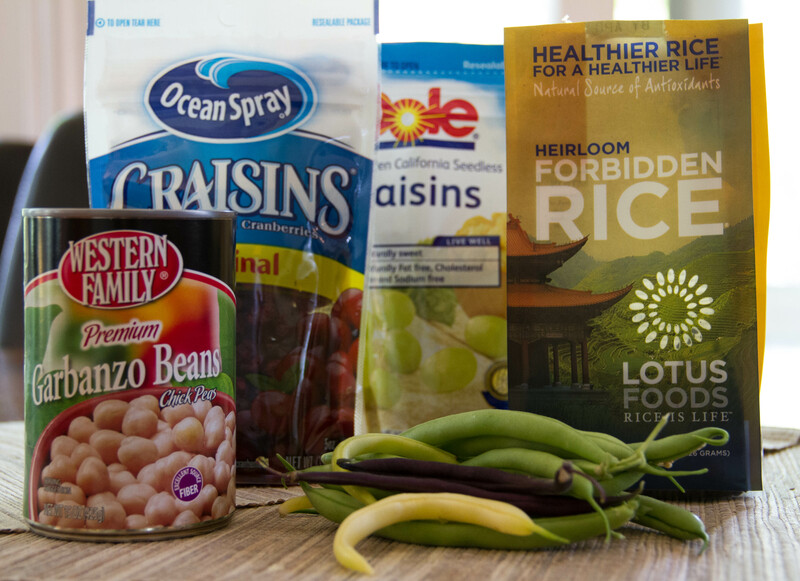 Feel free to use green beans or asparagus for the salad (I personally prefer the flavor of the asparagus in this recipe!) However, I have made it both ways and both are equally delectable! I hope you enjoy! 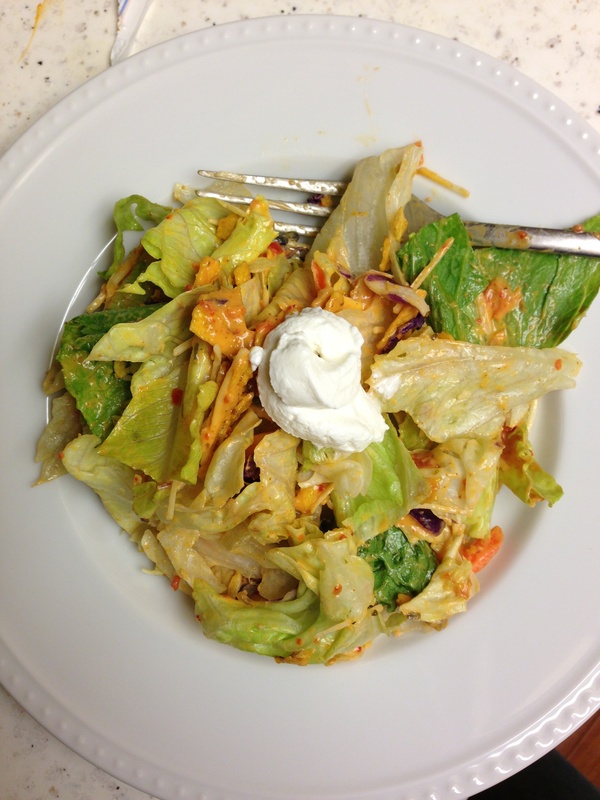 In a small bowl using a whisk, combine dressing ingredients, set aside. Bring 2 cups of water to a boil in a medium saucepan. Blanch the asparagus (or green beans) for 3-4 minutes. Remove immediately from the hot water and place in an ice bath or run under cold water to stop them from over cooking and becoming too soft. Extra dressing can be covered and stored in the refrigerator up to 1 week. Thanks to Mia from Blonded by Style for taking all the food pictures! Happy Wednesday, Y’all! I hope you had a wonderful long Memorial Day weekend! A big thank you to all our Veterans and Military for all you do and sacrifice! One of my fondest memories growing up was watching my grandfather march in his Marine uniform in the Litchfield Memorial Day parade. Memorial Day also officially kicks off SUMMER (and the right to wear white pants!) not to mention lots of BBQs, camping, outdoor activities and lawn games of every kind. This past weekend I went down to southern Utah to explore some of the hidden gems in our state. The longer I live here the more I realize just how cool our state is. You could spend your whole life visiting the National Parks in Utah and still you wouldn’t see everything the state has to offer. Last week we received our first CSA delivery from Urban Farm and Feed. We got so many delicious things including fresh eggs, kale, arugula, radishes, oregano and my favorite Rainbow Chard. Look how beautiful it is! I didn’t even enhance these photos, the chard is naturally this amazing color! What I love about the CSA (other than its local, fresh and amazing) is sometimes you get produce that you wouldn’t normally buy at the store and you are forced to cook something totally new. I am planning on taking you with me on my CSA journey of fun new vegetables, so stay tuned all summer long for great ideas and recipes for your produce, whether it’s from the farmers market or your CSA! 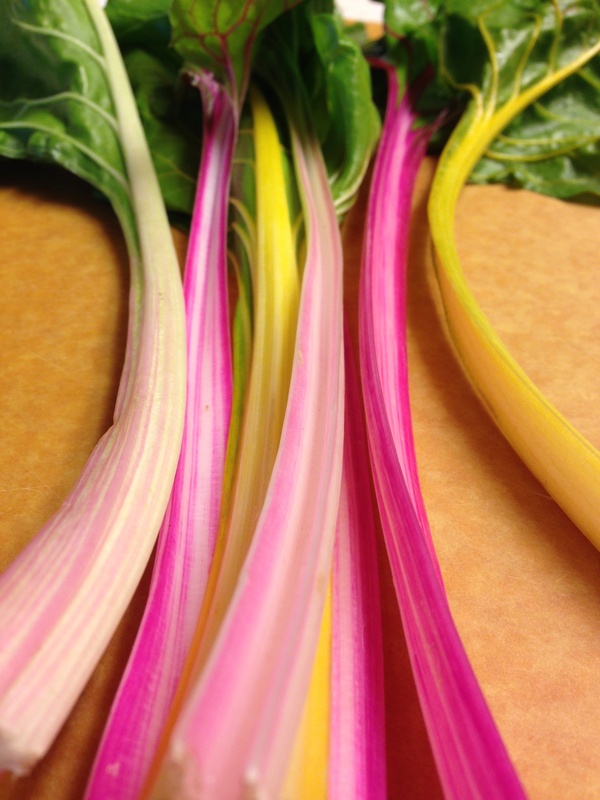 So lets kick off this summer party with some Rainbow chard. This recipe is super easy and takes just a few minutes to saute up. 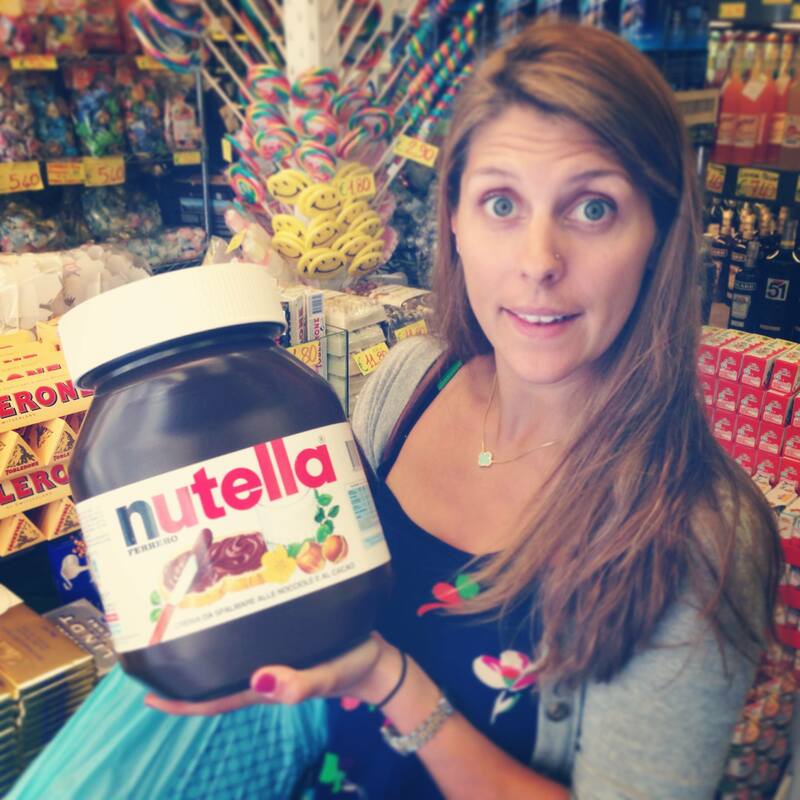 It goes great with chicken, steak, burgers, fish… well just about anything. I hope you enjoy! First, wash and dry the chard leaves and stems. Cut the stems from the chard leaves. Cut the leaves into 2- to 3-inch pieces. Slice the stems crosswise 1/4 inch thick. In a medium sauté pan or skillet, heat the olive oil over medium heat. Add the pine nuts and cook, stirring constantly, until lightly browned, 2 to 3 minutes. 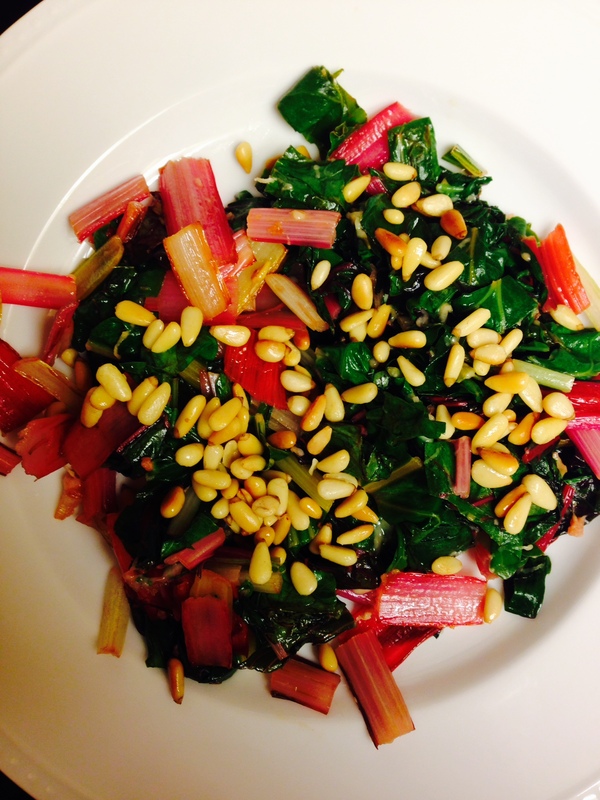 Using a slotted spoon, transfer the pine nuts to a plate, leaving behind as much oil as possible. Return the pan to medium-high heat, add the chard stems and a pinch of salt, and cook, stirring occasionally, until shrunken and beginning to brown lightly, 6 to 7 minutes. Add the garlic and cook just until fragrant, about 15 seconds. Remove the pan from the heat, add the butter pieces, Parmesan and basil, stir to combine. Using tongs, immediately transfer to a serving plate. Sprinkle toasted pine nuts and extra Parmesan if desired. Serve immediately. Happy weekend y’all! I hope you had a great week! Last weekend Park City mountain resort closed, it was a beautiful weekend, 60 degrees and sunny! Just when I thought spring had arrived… I woke up Tuesday morning to this… More snow! I couldn’t believe it! But that’s how it goes in the mountains! 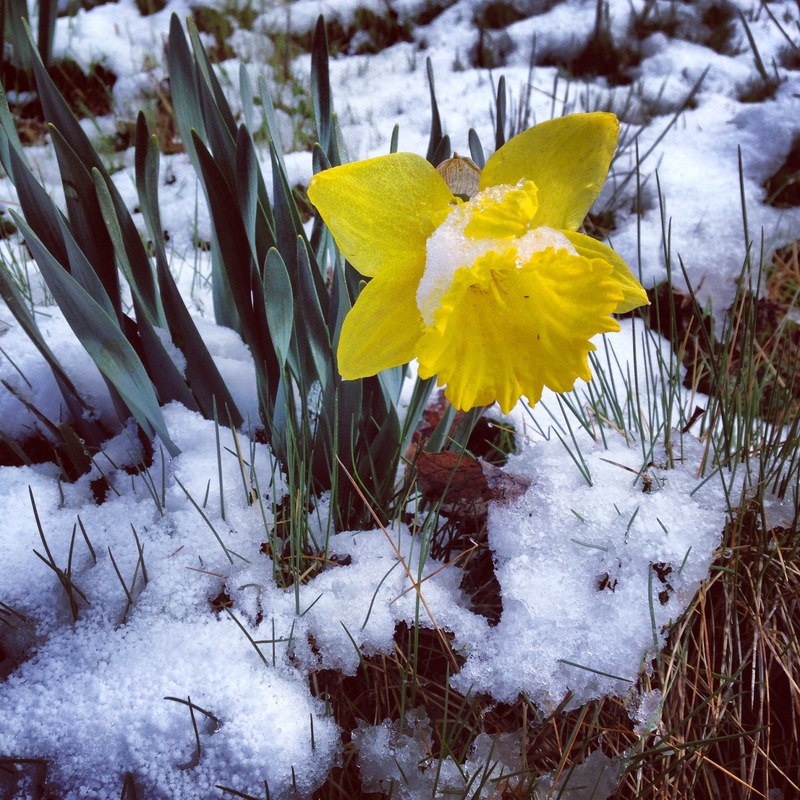 Sadly, I’m sure it won’t be the last time this spring we see snow. Regardless of what the weather does, I am READY for spring. 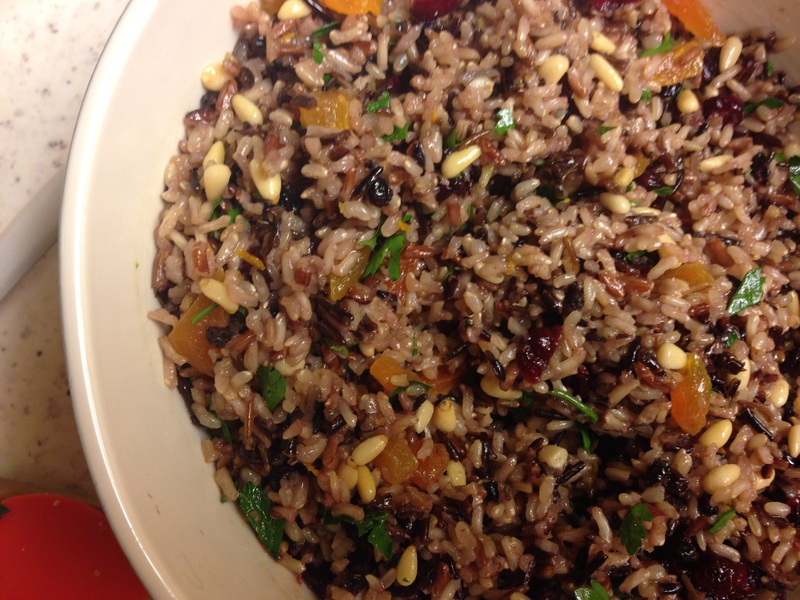 This delicious wild rice salad is one of my favorite spring/summer salads. It’s super easy to make and its best when it’s served cold, so making it the day before is a snap and saves you time! Its great for picnics, BBQs or anytime. 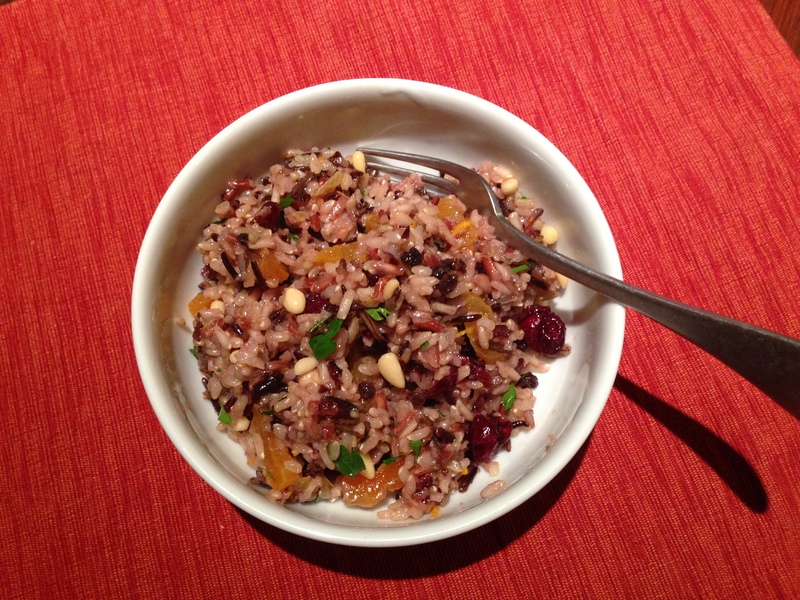 The combination of the sweet cranberries, apricots and currents with the wild rice and orange dressing is perfection! It will become one of your favorite summer staples. In a medium pot, bring water and broth to a boil, add the rice and bring it to a boil again. Reduce heat and simmer until the rice is tender but still firm- about 40-45 minutes. Meanwhile, whisk together the dressing ingredients and set aside. Drain the rice, transfer to a bowl and allow it to cool. 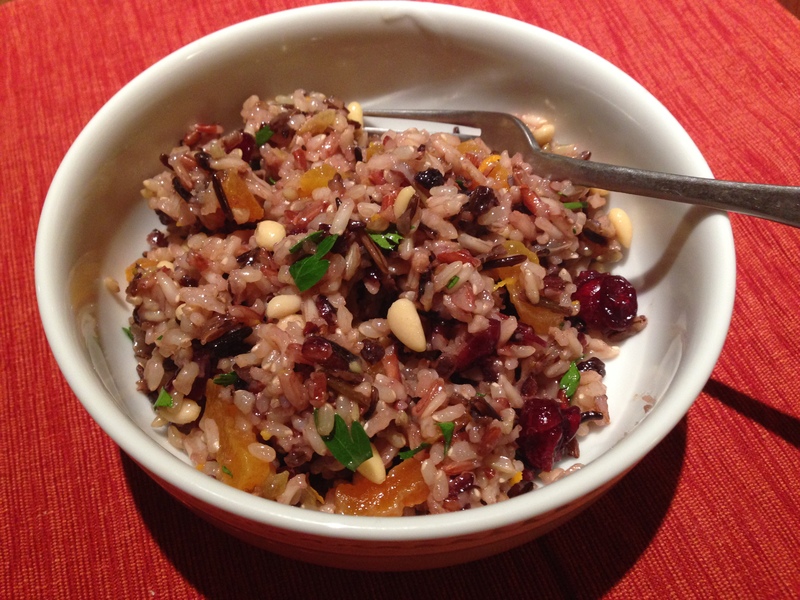 Mix the remaining ingredients with the rice, drizzle with orange dressing and gently toss to combine. Serve over spinach or on its own as a side dish.